By law, you must wear a safety helmet whilst riding a motorcycle on a public road. The only legal exception is members of the Sikh religion who wear a turban. Look out for the Safety Helmet Assessment and Rating Programme (SHARP) when purchasing. Even with the minimum safety regulations that are set out by UK law, many helmets vary in the level of protection they offer. SHARP offers a simple 1-to-5 star rating, where 5 stars offers the best safety possible. There are three main types of motorcycle helmets that you can choose from when purchasing. Full-face helmets – This is the most common type of helmet used. It full covers and protects the face in the event of an accident. Open-faced helmet – Offers less protection that a full-face helmet. A preferred style for some riders or for those that may feel claustrophobic by a full-face helmet. Typically word alongside googles or a visor. Flip-up helmet – Offers the advantages of a full-face and open-face helmet as the front face section is hinged and can flip up to resemble an open-face helmet. 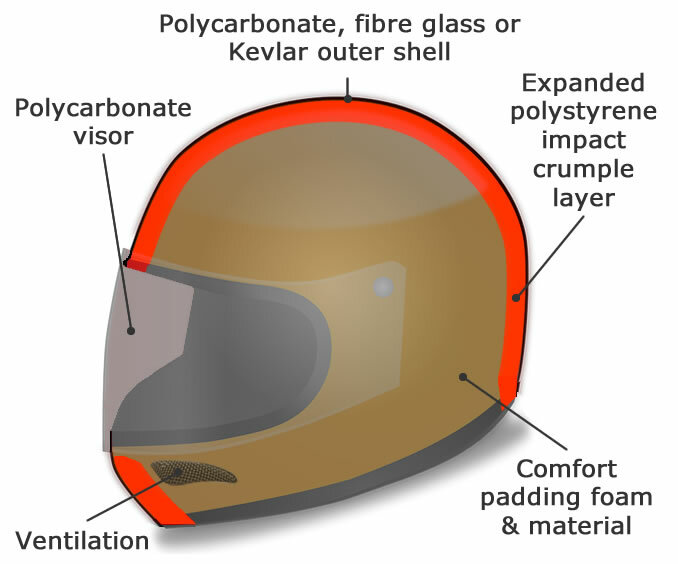 The impact absorbing layer inside a helmet is typically made of expanded polystyrene (EPS). This material is highly effective at absorbing impact. Helmet outer lays can comprise of polycarbonate, fibre glass or Kevlar. Kevlar helmets are often the most expensive but offer excellent strength along with being light weight. Crumble zones within the helmet are designed to absorb impact. They are designed for single use in such an event and should not be used again, even if an accident is minor. Damage to the helmet may appear light externally, though internally the helmet may have received sufficient damage to be rendered significantly less effective at providing protection in a second impact. As a result, never continue to use a helmet that has been involved in an accident, no matter how minor. Helmets may degrade over time and it can be difficult to tell how old a used or second-hand helmet is. A used helmet may also have been involved in an accident, but has subsequently been repaired. You can never be certain of the internal condition of a second-hand helmet. Always buy your motorcycle helmets brand new. Motorcycle helmets should feel comfortable but fit snugly. A loose fitting helmet may come off during an accident. Whichever method your helmet uses to fasten, it is illegal to ride with your helmet unsecured, or not secured properly. An unsecured helmet or a helmet that has not been fastened correctly may come off during an accident. Visors or goggles should be used whilst riding to protect your eyes from dirt, insects and weather elements such as rain and wind. Visors and goggles must comply with British Standards BS 4110:1999. British Standards Institution (BSI) Kite Mark must be displayed on the product. Alternatively, the product must comply with a European standard that must at least the same level of safety and protection ans that of the British equivalent. To maintain a clear view of the road ahead, you must clean your visor or goggles regularly. Specific cleaning instructions may be provided with your equipment by the manufacturer. If you do not have this information at hand, use warm soapy and use a soft cloth. Never use abrasive cleaning aids or solvents as they’re likely to scratch or damage the visor or goggles. Riding under a bright sun can be demanding on the eyes and so a rider may benefit from a tinted visor on their motorcycle helmet. During daylight, a tint of anything up to a maximum of 50% is legal. The specific tint will be made clear on purchase and certain legally tinted visors will be marked ‘For Daylight Use Only’. Riding with a helmet that does not contain ECE, CE or BSI approval mark is highly dangerous as protection may be significantly reduced in the result of an accident and the level of tint to the visor may exceed legal limits. It is illegal to ride with a visor that exceeds 50% tint during daylight and those that are marked ‘For Daylight Use Only’ must not be worn in low light conditions. If a police officer suspects your helmet or visor does not comply with UK laws, you may be faced with prosecution.